↑ "Facts About Cataract". September 2009. Archived from the original on 24 May 2015. Retrieved 24 May 2015. ↑ "Visual impairment and blindness Fact Sheet N°282". August 2014. Archived from the original on 12 May 2015. Retrieved 23 May 2015. ↑ GLOBAL DATA ON VISUAL IMPAIRMENTS 2010 (PDF). WHO. 2012. p. 6. Archived (PDF) from the original on 2015-03-31. ↑ "Priority eye diseases". Archived from the original on 24 May 2015. Retrieved 24 May 2015. ↑ Lamoureux, EL; Fenwick, E; Pesudovs, K; Tan, D (January 2011). "The impact of cataract surgery on quality of life". Current Opinion in Ophthalmology. 22 (1): 19–27. doi:10.1097/icu.0b013e3283414284. PMID 21088580. ↑ Rao, GN; Khanna, R; Payal, A (January 2011). "The global burden of cataract". Current Opinion in Ophthalmology. 22 (1): 4–9. doi:10.1097/icu.0b013e3283414fc8. PMID 21107260. ↑ Pandey, Suresh K. (2005). 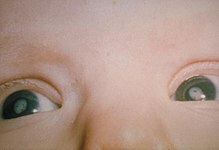 Pediatric cataract surgery techniques, complications, and management. Philadelphia: Lippincott Williams & Wilkins. p. 20. ISBN 9780781743075. Archived from the original on 2015-05-24. ↑ "Posterior Supcapsular Cataract". Digital Reference of Ophthalmology. Edward S. Harkness Eye Institute, Department of Ophthalmology of Columbia University. 2003. Archived from the original on 27 March 2013. Retrieved 2 April 2013. ↑ Reddy SC (1999). 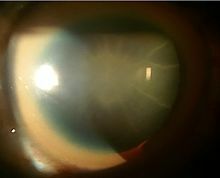 "Electric cataract: a case report and review of the literature". European Journal of Ophthalmology. 9 (2): 134–8. PMID 10435427. ↑ Ram, Jagat; Gupta, Rohit (2016). 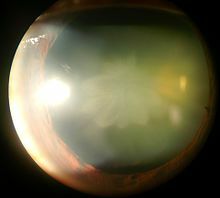 "Petaloid Cataract". New England Journal of Medicine. 374 (18): e22. doi:10.1056/NEJMicm1507349. ↑ Lipman RM, Tripathi BJ, Tripathi RC (1988). 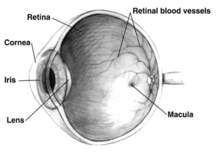 "Cataracts induced by microwave and ionizing radiation". Surv. Ophthalmol. 33 (3): 200–10. doi:10.1016/0039-6257(88)90088-4. PMID 3068822. ↑ Sliney DH (1994). "UV radiation ocular exposure dosimetry". Doc. Ophthalmol. 88 (3–4): 243–54. doi:10.1007/bf01203678. PMID 7634993. ↑ Christen WG, Manson JE, Seddon JM, Glynn RJ, Buring JE, Rosner B, Hennekens CH (August 1992). "A prospective study of cigarette smoking and risk of cataract in men". JAMA. 268 (8): 989–93. doi:10.1001/jama.1992.03490080063025. PMID 1501324. ↑ Wang S, Wang JJ, Wong TY (2008). "Alcohol and eye diseases". Surv. Ophthalmol. 53 (5): 512–25. doi:10.1016/j.survophthal.2008.06.003. PMID 18929762. ↑ Wei, L.; Liang, G.; Cai, C.; Lv, J. (May 2016). "Association of vitamin C with the risk of age-related cataract: a meta-analysis". Acta Ophthalmologica. 94 (3): e170–6. doi:10.1111/aos.12688. PMID 25735187. ↑ Mathew MC, Ervin AM, Tao J, Davis RM (Jun 13, 2012). "Antioxidant vitamin supplementation for preventing and slowing the progression of age-related cataract". Cochrane Database of Systematic Reviews. 6: CD004567. doi:10.1002/14651858.CD004567.pub2. PMC 4410744. PMID 22696344. ↑ Weatherall, M; Clay, J; James, K; Perrin, K; Shirtcliffe, P; Beasley, R (September 2009). "Dose-response relationship of inhaled corticosteroids and cataracts: a systematic review and meta-analysis". Respirology (Carlton, Vic.). 14 (7): 983–90. doi:10.1111/j.1440-1843.2009.01589.x. PMID 19740259. ↑ Hodge, WG; Whitcher, JP; Satariano, W (1995). "Risk factors for age-related cataracts". Epidemiologic Reviews. 17 (2): 336–46. doi:10.1093/oxfordjournals.epirev.a036197. PMID 8654515. ↑ Uçok A, Gaebel W (February 2008). "Side effects of atypical antipsychotics: a brief overview". World Psychiatry. 7 (1): 58–62. doi:10.1002/j.2051-5545.2008.tb00154.x. PMC 2327229. PMID 18458771. ↑ van den Brûle J, Degueldre F, Galand A (December 1998). "Cataractes incitées de médicament" [Drug-induced cataracts]. Revue Médicale de Liège (in French). 53 (12): 766–9. PMID 9927876. ↑ "Triperanol". MeSH. National Library of Medicine. Archived from the original on 2015-12-22. Retrieved 2013-02-06. ↑ Almony, Arghavan; Holekamp, Nancy M; Bai, Fang; Shui, Ying-Bo; Beebe, David (2012). "Small-gauge vitrectomy does not protect against nuclear sclerotic cataract". Retina. 32 (3): 499–505. doi:10.1097/IAE.0b013e31822529cf. PMID 22392091. ↑ Kokavec, Jan; Min, San H; Tan, Mei H; Gilhotra, Jagjit S; Newland, Henry S; Durkin, Shane R; Grigg, John; Casson, Robert J (2016). "Biochemical analysis of the living human vitreous". Clinical & Experimental Ophthalmology. doi:10.1111/ceo.12732. ↑ Donati, Simone; Caprani, Simona Maria; Airaghi, Giulia; Vinciguerra, Riccardo; Bartalena, Luigi; Testa, Francesco; Mariotti, Cesare; Porta, Giovanni; Simonelli, Francesca; Azzolini, Claudio (2014). "Vitreous Substitutes: The Present and the Future". BioMed Research International. 2014: 351804. doi:10.1155/2014/351804. PMC 4024399. PMID 24877085. ↑ Shui, Ying-Bo; Holekamp, Nancy M.; Kramer, Benjamin C.; Crowley, Jan R.; Wilkins, Mark A.; Chu, Fred; Malone, Paula E.; Mangers, Shayna J.; Hou, Joshua H.; Siegfried, Carla J.; Beebe, David C. (2009). "The Gel State of the Vitreous and Ascorbate-Dependent Oxygen Consumption". Archives of Ophthalmology. 127 (4): 475–82. doi:10.1001/archophthalmol.2008.621. PMC 2683478. PMID 19365028. ↑ Jalil, A; Steeples, L; Subramani, S; Bindra, M S; Dhawahir-Scala, F; Patton, N (2014). "Microincision cataract surgery combined with vitrectomy: a case series". Eye. 28 (4): 386–9. doi:10.1038/eye.2013.300. PMC 3983625. PMID 24406418. ↑ Bollinger KE, Langston RH (2008). "What can patients expect from cataract surgery?" (PDF). Cleveland Clinic Journal of Medicine. 75 (3): 193–196, 199–196. PMID 18383928. ↑ Spencer RW, Andelman SY (1965). "Steroid cataracts. Posterior subcapsular cataract formation in rheumatoid arthritis patients on long term steroid therapy". Arch. Ophthalmol. 74: 38–41. doi:10.1001/archopht.1965.00970040040009. PMID 14303339. ↑ Greiner JV, Chylack LT (1979). "Posterior subcapsular cataracts: histopathologic study of steroid-associated cataracts". Arch. Ophthalmol. 97 (1): 135–44. doi:10.1001/archopht.1979.01020010069017. PMID 758890. ↑ Yanoff, Myron; Duker, Jay S. (2008). Ophthalmology (3rd ed.). Edinburgh: Mosby. p. 412. ISBN 978-0323057516. ↑ Neale RE, Purdie JL, Hirst LW, Green AC (November 2003). "Sun exposure as a risk factor for nuclear cataract". Epidemiology. 14 (6): 707–712. doi:10.1097/01.ede.0000086881.84657.98. PMID 14569187. ↑ Barker FM (August 2010). "Dietary supplementation: effects on visual performance and occurrence of AMD and cataracts". Curr. Med. Res. Opin. 26 (8): 2011–23. doi:10.1185/03007995.2010.494549. PMID 20590393. ↑ Ma, L.; Hao, Z.; Liu, R.; Yu, R.; Shi, Q.; Pan, J. (2013). "A dose–response meta-analysis of dietary lutein and zeaxanthin intake in relation to risk of age-related cataract". Graefe's Archive for Clinical and Experimental Ophthalmology. 252 (1): 63–70. doi:10.1007/s00417-013-2492-3. ↑ Hayashi, R. (2014-11-01). "The Effects of Lutein in Preventing Cataract Progression". In Babizhayev, M. A.; Li, D. W.-C.; Kasus-Jacobi, A.; Žorić, L.; Alió, J. L. Studies on the Cornea and Lens. Oxidative Stress in Applied Basic Research and Clinical Practice. pp. 317–326. doi:10.1007/978-1-4939-1935-2_17. ISBN 9781493919345. ↑ Klein BE, Klein R, Lee KE, Grady LM (2006). "Statin Use and Incident Nuclear Cataract". Journal of the American Medical Association. 295 (23): 2752–8. doi:10.1001/jama.295.23.2752. PMID 16788130. ↑ Olsen T, Jeppesen P (2012). "The Incidence of Retinal Detachment After Cataract Surgery". The Open Ophthalmology Journal. 6: 79–82. doi:10.2174/1874364101206010079. PMC 3447164. PMID 23002414. ↑ Herrmann W, Helbig H, Heimann H (2011). "Pseudophakie-Ablatio". Klinische Monatsblätter für Augenheilkunde. 228 (3): 195–200. doi:10.1055/s-0029-1246116. PMID 21374539. ↑ Behndig A, Montan P, Stenevi U, Kugelberg M, Lundström M (August 2011). "One million cataract surgeries: Swedish National Cataract Register 1992–2009". 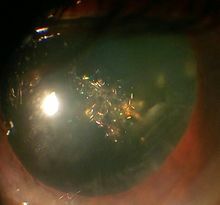 J. Cataract Refract. Surg. 37 (8): 1539–45. doi:10.1016/j.jcrs.2011.05.021. PMID 21782099. ↑ Juthani VV, Clearfield E, Chuck RS (2017). "Non-steroidal anti-inflammatory drugs versus corticosteroids for controlling inflammation after uncomplicated cataract surgery". Cochrane Database Syst Rev. 7: CD010516. doi:10.1002/14651858.CD010516.pub2. ↑ "Posterior capsule opacification – why laser treatment is sometimes needed following cataract surgery". rnib.org.uk. Archived from the original on 2009-09-17. ↑ Dr. Kushal Banerjee (2006). "A review and clinical evaluation of per-operative and post-operative complications in case of manual small incision cataract surgery and extracapsular cataract extraction with posterior chamber intra-ocular lens implantation" (PDF). Archived from the original (PDF) on 5 June 2014. Retrieved 1 June 2014. ↑ "Priority eye diseases: Cataract". Prevention of Blindness and Visual Impairment. World Health Organization. Archived from the original on 2015-05-24. ↑ The global burden of disease : 2004 update. Geneva, Switzerland: World Health Organization. 2008. p. 35. ISBN 9789241563710. ↑ Sperduto RD, Seigel D (Jul 1980). "Senile lens and senile macular changes in a population-based sample". Am. J. Ophthalmol. 90 (1): 86–91. doi:10.1016/s0002-9394(14)75081-0. PMID 7395962. ↑ Kahn HA, Leibowitz HM, Ganley JP, Kini MM, Colton T, Nickerson RS, Dawber TR (Jul 1977). "The Framingham Eye Study. I. Outline and major prevalence findings". Am. J. Epidemiol. 106 (1): 17–32. PMID 879158. ↑ "Eye Health Statistics at a Glance" (PDF). Archived from the original (PDF) on March 17, 2015. ↑ "Health Topics: Cataract". World Health Organization – Eastern Mediterranean Regional Office. Archived from the original on 2013-09-27. ↑ Liu, Yu-Chi; Wilkins, Mark; Kim, Terry; Malyugin, Boris; Mehta, Jodhbir S (2017). "Cataracts". The Lancet. 390 (10094): 600–612. doi:10.1016/S0140-6736(17)30544-5. PMID 28242111. ↑ Goes, Frank Joseph (2013). The Eye in History. JP Medical Ltd. p. 371. ISBN 9789350902745. ↑ Aulus Cornelius Celsus, G. F. Collier (transl.) (1831). De Medicinae. OL 5225311W. ↑ "Galen: On Anatomical Procedures: the Later Books". Med Hist. 7 (1): 85–87. doi:10.1017/s002572730002799x. 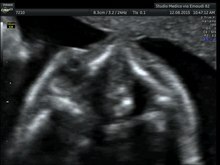 PMC 1034789. ↑ Williams DL, Munday P (2006). "The effect of a topical antioxidant formulation including N-acetyl carnosine on canine cataract: a preliminary study". Vet Ophthalmol. 9 (5): 311–6. doi:10.1111/j.1463-5224.2006.00492.x. PMID 16939459. ↑ Guo Y, Yan H (2006). "Preventive effect of carnosine on cataract development". Yan Ke Xue Bao. 22 (2): 85–8. PMID 17162883. ↑ Toh T, Morton J, Coxon J, Elder MJ (2007). 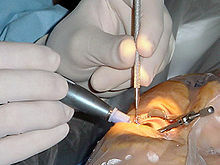 "Medical treatment of cataract". Clin. Experiment. Ophthalmol. 35 (7): 664–71. doi:10.1111/j.1442-9071.2007.01559.x. PMC 513688. PMID 17894689. ↑ "Stem cells used to repair children's eyes after cataracts". NHS. March 10, 2016. Archived from the original on 11 March 2016. Retrieved 11 March 2016.